SECURalert ™ and XTendCall ™ platform improves work place productivity. XTendCall ™ enables connectivity and alarm management of 3rd party systems such as security, communication, fire alarm, management systems and many others. XTendCall ™ also provides unified reporting and extends notification to its mobile app and other wired and wireless devices. Easy to read large text for alarms and messages with audible and vibrate functionality. Sound and vibrate pattern are determined by the urgency of the alert. Manage alerts internally and/or externally. Accept alarms. The app indicates to the other users who is responding in the same work area. 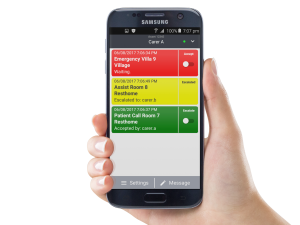 Alerts and response times are recorded for reporting and team leader follow-up. Supports internal or external roster and automated escalation systems. Alerts can also be manually escalated from your mobile device for attention from senior staff. Imbedded call back feature to speak with staff or residents on their own phone/device without having to look up a phone number/extensions. Send in-house text messages to devices then receive notification when the message is read. Multi line, multi colored display gives a clear indication of the alert priority and all the information a staff member needs to respond to the alarm. Receive accurate room level locations and updates in real time when used with our Hybrid and Inovonics solutions. Multi-user login is available on a role base or schedule on any device. Devices can also be locked to a single user. All stored configuration data is encrypted, no data is stored on the device. BYOD (Bring Your Own Device) compatible. Get the app on Google Play.